On September 24th, Sephora unveiled a 3-D sculpture and original animation by renowned international pop artist Keiichi Tanaami. 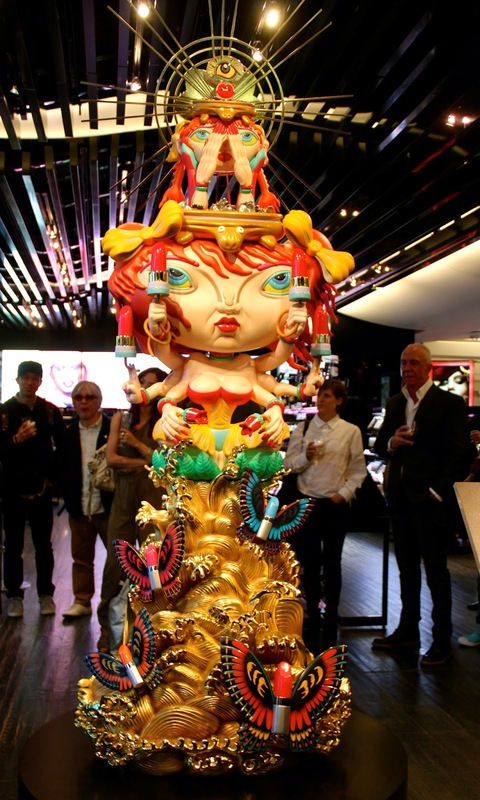 Both pieces were commissioned exclusively by Sephora and will remain on display at the Sephora Meatpacking store. The six-foot-tall scultpure, entitled Kannon of Beauty, was influenced by the image of Kannon Bosatsu (or "God of Mercy," in Japanese Buddhism). "It is said that Kannon Bosatsu has one thousand arms, extending mercy to one thousand people," notes Tanaami, who continues: "I have chosen to use only six hands, with each functioning as a magical device to enhance beauty." Around the head sits a brilliant halo (“Kohai”), while below, fluttering butterflies represent both the ephemerality and eternality of beauty. Inspired by Lewis Carroll’s iconic Alice in Wonderland, Keiichi Tanaami’s animation Adventures in Beauty Wonderland picks up on motifs from a number of his favorite artworks, including The Scream by Edvard Munch and Elephant and Whale Screens by Ito Jakuchu. Set against a backdrop of cherry blossoms and flying lipsticks, the animation follows 100 creatures as they travel alongside Alice. As she moves through land and water—even meeting Kannon of Beauty along the way—Alice finds her once-dull world colorfully transformed. TANAAMI_VIDEO from Christopher Miller on Vimeo.